The Do LaB always does it good, and the pre-party in Los Angeles serves to be a testament to just how good Lightning in a Bottle is going to be. Featuring Astronautica, Autograf, Coyote Kisses, Dimond Saints, G Jones, HOJ, Justin Jay, KMLN, and Nominus, Club Nokia had the crowd swaying, roaring, and gettin’ down to all of the above. The venue was superb. While it wasn’t the same outdoor, post-apocalyptic hippie vibes like the Do LaB Stage @ Coachella, the magic was still there: the venue, the crowd, the ambiance – they all came together to re-create the unique feel that the Do LaB always brings to the table. The first floor included vendors selling cool festival merch on the left facing the stage, an impeccable sound system that really allowed for the intricacies of the music to be heard, and flow artists and dancers alike gyrating across a huge stage. The second floor had a more futuristic vibe to it. 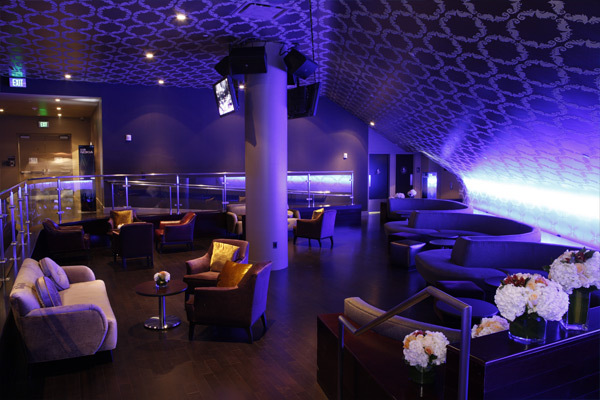 Usually Club Nokia’s VIP Lounge, it was open to all guests attending the event. It was smaller, too, allowing for a lot more intimacy as the artists were literally an arm’s length away. Our night began with Astronautica, a 22 year-old Los Angeles native on the first floor. The young producer brought soulful, soothing vibes to the venue as it began to warm up. She was a perfect opening act: nobody was quite ready to get down yet, but even then she had the crowd swaying back and forth to her lush ambient synths and soft bass swells. Her intricate, creative beats were subtle and soft, and was overall a solid introduction to the rest of the night. Coyote Kisses turned the chill vibes that Astronautica brought right around. They were an absolutely brilliant duo, and brought the dance to the dance floor. While many of their songs transcended genre, the clear influences of tropical, glitch hop, and dubstep synths led to a dirty combination of dancey future bass had the people getting down to their solid mixes. Sharp kicks, creative synths, and heavy bass waves turned the venue way up. We caught a part of Nominus’ set before making our way upstairs, and it was honestly not quite as powerful or creative as the previous sets. The native San Franciscan didn’t bring his usual world-music sound to the table. The chunky, deep bass rhythms were there, but the synths weren’t quite as unique. Most of his glitch-hop, organic, string sounds had been swapped in replacement of generic, hardstyle, dubstep blasts. While he clearly brought the upbeat energy and solid stage presence to his set, his foray into heavy, glitchy dubstep ultimately did not resonate with the burner-esque crowd. Regardless, he was still a good introduction to the bass-heavy Dimond Saints, and just didn’t quite resound with the crowd this time around. We went upstairs to catch the tropical Autograf. His soft steel-drum esque, xylophone synths and solid snares came together to get the crowd getting down. A weird, rhythmic mixture of disco, soulful vocals, and Caribbean vibes, Autograf definitely had the people jigging, even with a hype xylophone solo at one point. Playing downstairs, the Dimond Saints absolutely killed it. Their ominous, dark, intricate music clearly resonated with the turn-up that the crowd wanted. Heavy-hitting, clean snares, rhythmic bass lines, and futuristic synths came together in a fashion that couldn’t be defined. The production was clearly influenced heavily by electronic, but somehow managed to seem organic. The combination of soulful vocal samples, orchestral strings, and sharp kicks definitely had the burner-esque crowd moving, and their charismatic stage presence certainly had a hand in that. We went back upstairs to catch Justin Jay‘s funky, soul-jazz deep house vibes. Just like most of the artists that played that night, he was incredibly creative. Taking the funk and jazz and blending them with swift kicks and solid bass lines got the people shuffling and stepping. For the finale of the night, we caught G Jones absolutely tearing up the crowd. His syncopated beats and trap, bass-heavy hip-hop instrumentals completely lit up the dance floor. The 21 year-old producer from Santa Cruz was feeling the turn-up as well, jumping up and down on the stage to the rhythm of his space-like synths and dancey hip-hop samples. G Jones was an absolutely perfect way to end the night and provided the party that the crowd wanted. Ultimately, the pre-party was an awesome experience and appetizer to the killer event that Lightning in a Bottle will definitely be.